Cybercriminals and hackers will try various techniques to gain information from their victims. The most used technique is the remote access trojan which allows the cybercriminal to gain full control of the infected device. In the League of Legends Facebook group, a user posted a picture which can be seen above. The picture clearly shows an warning for the Win32:Evo-Gen trojan. 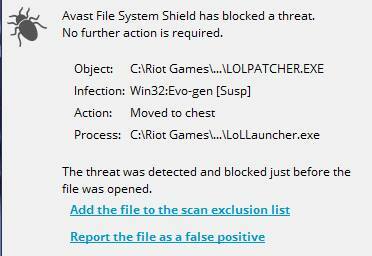 The antivirus package directly send the malicious lolpatcher.exe file to the sandbox environment of the AVAST antivirus.